SHWE PYAUK, Rangoon Division — In the beginning, they had a bleak destiny. Clubbed on their heads and knocked unconscious at night, they were thrown onto a cart and dumped in a cage. When their headcount eventually reached 200, they would be shipped again, this time to the butchers’ blocks at restaurants over the border in China, where dog meat is considered a delicacy. 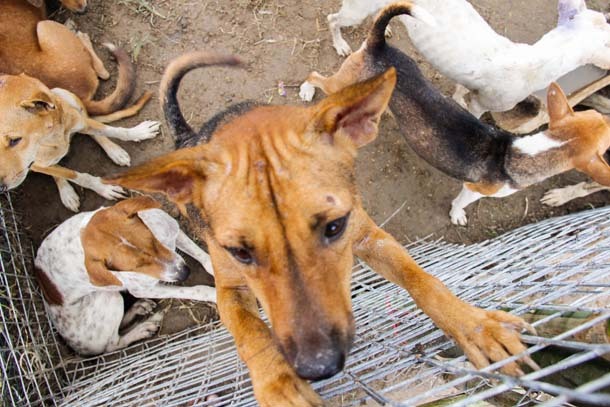 Were it not for Myat Thet Mon, this group of more than 120 mutts from the town of Pa Late, near Burma’s second-largest city, Mandalay, would still be crammed into small wire cages, painfully awaiting their turn for slaughter. But now, as luck would have it, they are roaming freely around a temporary shelter more than an hour’s drive from Rangoon, in a space that’s nearly 25 meters by 12 meters…..